Our Nation must get into Productivity mode! We are passionate about modeling the way to develop well-rounded, dynamic people; to revive our values of Visioning, Professionalism & Entrepreneurship & Productivity. We need to grow, become peak performers and boost economic growth by building awesome businesses, creating and accessing great jobs. The Productivity Plus Summit is Nigeria’s first personal development fair. It is a much – needed platform for providers of Life-enhancing products & services to proffer solutions to our personal growth challenges. We will explore Career, Business, Further Education, Wealth, Health, Confidence, Vision, Fears, Empowerment, Beliefs, Relationships and Fun!! We have signed up the very best speakers, like Tara Durotoye, Carlton Williams, Nike Ogunlesi, Arousa the employment Coach, Smart Money Arese, Lanre Olusola, DDK, Toyin Ademola, Yetty Williams, Iwo Akinyoyenu, Dayo Obisan, Dundun Peterside. It's a great place to learn what you need for Productivity, Success & Financial Freedom. We promise your life won't remain the same!! Get as many of your friends as possible to attend the Summit with you. You and your friends should register on eventbrite individually and choose the "club ticket"
The club with the highest no. of members (minimum 10 members) gets the 6 month group coaching programme totally free!!! 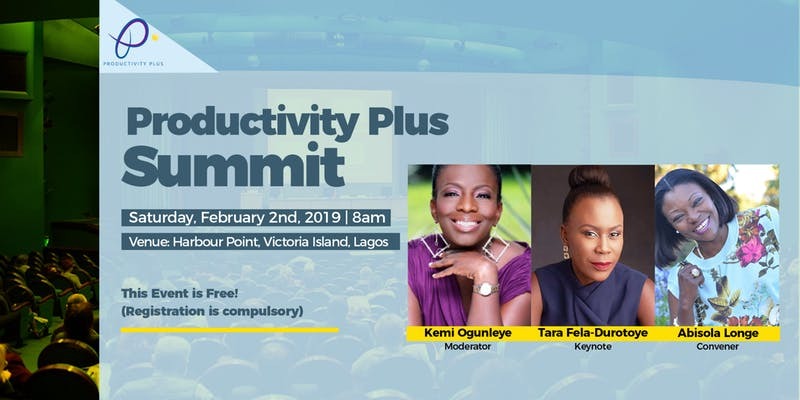 Taking place at the Harbour Point, Victoria Island, it is the premium event for Personal Development, Productivity, Success and Financial Freedom. At the Summit, attendees get to experience and explore world-class Coaches, Providers of Adult Education, Workplace Wellness, Mental & Physical Health, Fitness & Movement, Meaning, Purpose and Living a life of vision. Undergraduates, graduates, entrepreneurs, young career professionals…. anyone looking to have a hugely successful life should definitely attend! Our Speakers are accomplished individuals at the very height of achievement in their fields. There will be many opportunities to connect, network, listen, learn, grow and have fun! We will provide resources for high potential individuals; teaching you how to achieve personal growth across all arenas of your lives. It promises to be an extraordinary, impactful, high–octane, high energy-event that will inspire you to realize your greatest potential. Let’s come together to learn from the best teachers and explore cutting-edge, transformational practices to become the best versions of ourselves. What is the Purpose of the Summit? To educate, enlighten and entertain and inspire. The ultimate objective is to increase productivity levels across different sectors of the economy thereby boosting the country’s per capita GDP and spurring economic growth. There is a huge car park and plenty of buses to Wilmot Point junction. Shuttle buses will be provided for club ticket holders. What's the agenda/programme of events? The day starts at 8am prompt with a short Group Coaching Session, followed by Tara Durotoye's keynote "My Productivity Plus Journey". 2 hour workshops with our panel of Speakers follow. The event closes with a fun competition with prizes to be won. Stalls and Booths with Coaches, Health Food, Financial Advisers, Fun & Leisure and other Life-enhancing products/services are open all day.